The wage shocks and are drawn from a multivariate normal distribution and are correlated. The agents know all of these values and wages don’t adjust. Every dot is one agent. The x-axis shows their source country wages and the y-axis their host country wages. The cloud of dots is centered on (100, 100). Agents marked red choose to emigrate and agents marked blue choose to stay. The slope of the line separating the red and blue dots is steeper, the higher cost of moving we pick. Autor shows that there are three cases for migration. With the current settings in the simulation, we get positive hierarchical sorting. 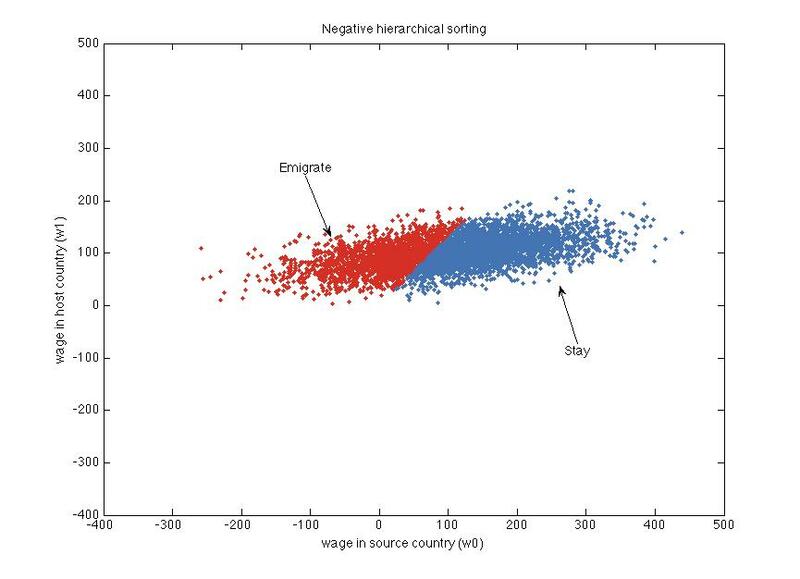 This comes about if the wage shocks are sufficiently positively correlated across countries and the wage distribution is more dispersed in the host country than in the source country. Then, only the most productive will migrate. 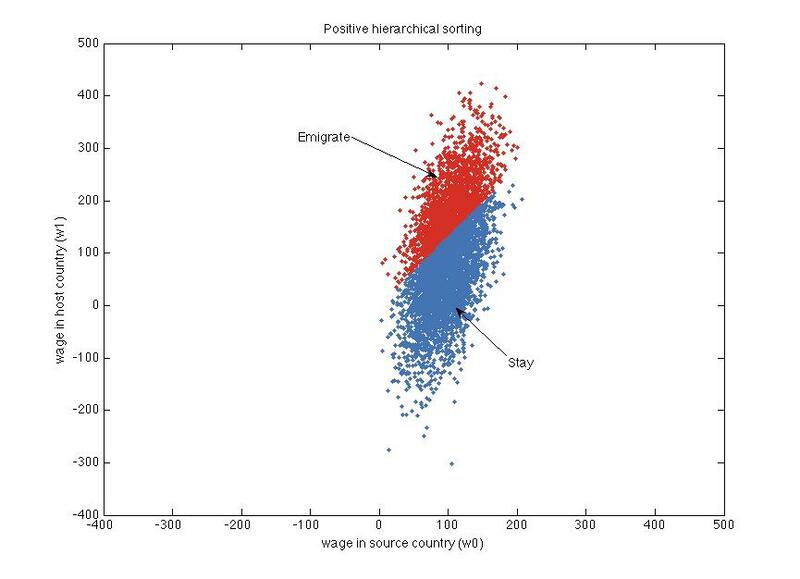 Those who migrate have above-average wages in both the source and the host country. The wage shocks still need to be positively correlated across countries, but now the wages in the host country are more compressed than in the source country. Now, only less productive agents will migrate and emigration acts as an insurance. In this case, the mean wages (of those who choose to emigrate) is below the average of 100 in both countries. 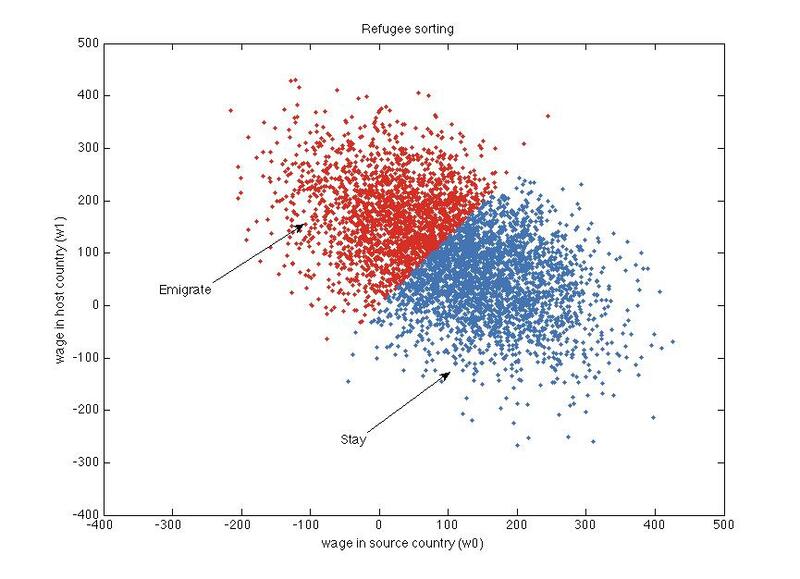 Here, migrants go from below-average wages in the source country to above-average wages in the host country. This could be the case if highly productive people are suppressed in their home countries. The growing focus of empirical economists on applying instrumental variables to causal estimation is in large part a response to the realization that self-selection (i.e., optimizing behavior) plagues interpretation of ecological relationships. […] But instrumental variables are not the only answer to testing cause and effect with observed data. Self-selection also points to the existence of equilibrium relationships that should be observed in ecological data […], and these can be tested without an instrument. In fact, there are some natural sciences that proceed almost entirely without experimentation — for example, astrophysics. How do they do it? Models predict nonobvious relationships in data. These implications can be verified or refuted by data, and this evidence strengthens or overturns the hypotheses. Many economists seem to have forgotten this methodology.